The neighborhood name “Wedgwood” is the legacy of 1940s developer Albert Balch. As more houses were built and the neighborhood grew in the busy post-World-War-Two period, businesses began naming themselves Wedgwood. Soon Wedgwood became the accepted name for the entire area, not just the sections of houses that Balch had built. Prior to the Balch era, the neighborhood had sometimes been known as “Morningside” because of promotion by a 1920s real estate development company. Copyright notice: text and photos in this article are protected under a Creative Commons Copyright. Please cite the source if you copy text and photos from this article. Wedgwood banner cartoon by Bob Cram, Wedgwood Community Council Newsletter of March 1996. Used by permission; do not copy. As a neighborhood name, “Morningside” was often used until Albert Balch’s 1940s Wedgwood development gained greater renown and came into popular usage. Prior to 1920 a church group called Morningside Sunday School Union was started as an extension of First Presbyterian Church in downtown Seattle. The Morningside Sunday School met in a one-room building on the northwest corner of NE 92nd Street & 27th Ave NE (present site of houses 2548 and 2558 NE 92nd Street.) By the 1940s the church was called Morningside Branch Presbyterian. They met in a partially-completed building at 95th & 35th, present site of Northeast Veterinary Hospital at 9505 35th Ave NE. The church renamed itself Wedgwood Presbyterian just before the congregation moved to a new building at 8008 35th Ave NE, its present location. Morningside Heights at 95th and 35th is the only building named for the plat, within the plat. Photo by Valarie. Morningside Market at 9118 35th Ave NE, built in 1926, is the only neighborhood business which has kept the Morningside name continuously since the 1920s, but ironically, the store, which is on the east side of 35th Ave NE, is not within the Morningside Heights plat. The Morningside Heights plat is on the west side of 35th Ave NE, from NE 90th to 95th Streets, 25th to 35th Avenues NE. 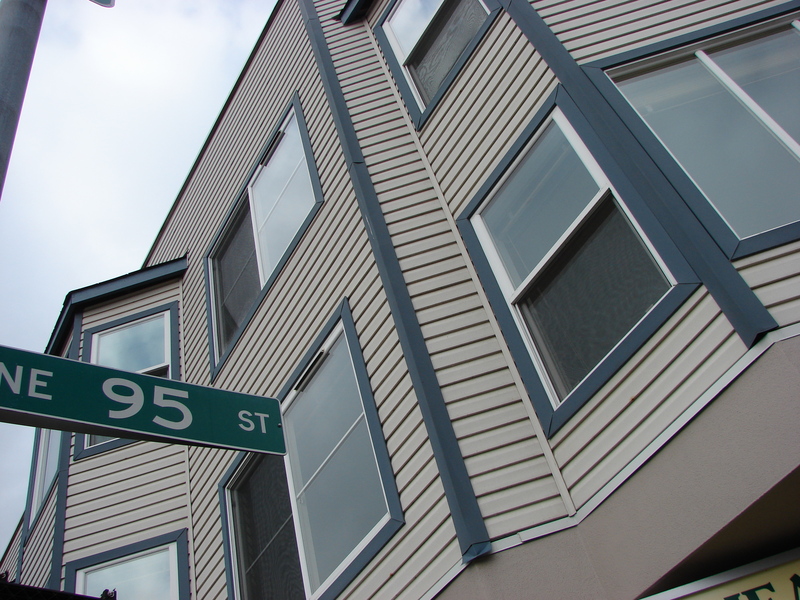 In 1994 a mixed-use building with ground level retail stores and upper level apartments was built at 9425 35th Ave NE. Named Morningside Heights, it is the only commercial building to be named for the plat, within the plat. The Wedgwood neighborhood was outside of the Seattle City limits until the 1940s. Map courtesy of HistoryLink. In contrast with other residential neighborhoods of northeast Seattle such as Fremont and Green Lake, the Wedgwood area was slow to develop. One of the reasons was Wedgwood’s distance from the downtown core of Seattle. Because of distance, terrain, and sparse settlement, streetcar service never reached northeast Seattle and Wedgwood did not get water and electric utilities until the 1920s. Wedgwood was quite rural and was outside the city limits until after World War Two. Slow development meant that early in the twentieth century, some real estate speculators invested in land in Wedgwood but found it difficult to sell lots for houses. In 1907 the McLaughlin Realty Company tried to develop land from NE 85th to 90th Streets on the west side of 35th Ave NE, but the lots didn’t sell very fast. The McLaughlins had gambled on water and electric utilities coming to Wedgwood more quickly because of the Alaska-Yukon-Pacific Exposition (AYP), a world’s fair held on the campus of Seattle’s University of Washington in 1909. The University District received utilities and street upgrades in advance of the AYP, but the civic makeover didn’t extend out as far as Wedgwood. In 1917, after twelve years in Seattle, McLaughlin Realty closed down their operations and left town. 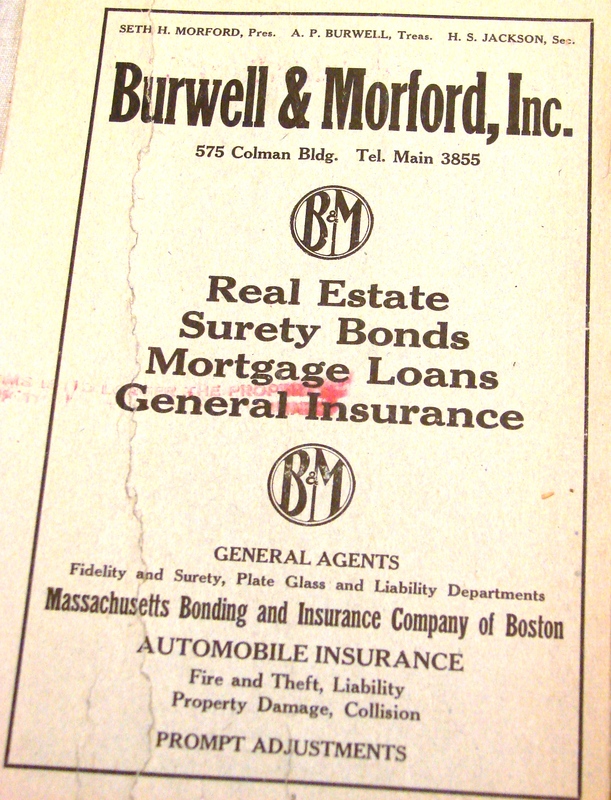 In 1920 the Burwell & Morford Real Estate Company took out a full-page ad which appeared on the inside front cover of the Seattle City Directory. The Morningside Heights plat was filed in 1913 by Burwell & Morford, Inc., a real estate and mortgage company. They had bought the land some years before filing the plat, and then waited for the right time to begin developing it. The company was well-capitalized and very diversified: they had several lines of business, including insurance. Burwell & Morford were also owners of retail businesses such as the Seattle Hardware Store at First & King Streets, downtown. They could afford to buy land in outlying areas and wait for it to increase in value, which is what they did with their Morningside Heights plat; they held most of the property and waited for future development. Seth Morford, one of the founders and officers of the company, had come to Seattle as a teenager with his parents. He was a high school student on the day of Seattle’s Great Fire, June 6, 1889, and he had been one of those who participated in that day’s dramatic efforts to carry furniture and other property from endangered buildings. The next year, 1890, Morford was in the very first class of high school graduates in Seattle. Throughout his long career in real estate Seth Morford was revered as “one of the pioneers” and this helped his business, as people admired and had confidence in him. He symbolized stability and success through the ups and downs of Seattle history, with booms and busts in the economy. In their lifetimes Seth Morford and the other Burwell & Morford company founders had experienced extremes in the Seattle economy, such as the Panic of 1893 when many Seattleites went broke. Like a farmer who plants different kinds of crops in different fields, Burwell & Morford knew that they needed to be diversified so that they could derive income from more than one source. Unlike the McLaughlin Realty men, who had come from Detroit looking to get rich quick, the Burwell & Morford officers had fall-back plans with investments in different types of businesses, so that they could stay in Seattle for the long haul. Walter Wood’s house as it looked in 1937-1938, the year that all houses in King County were first photographed for the tax assessor’s office. Photo courtesy of Puget Sound Regional Archives. A few houses were built in the Morningside Heights plat beginning in 1913, for those willing to live a pioneer lifestyle with well water and kerosene lamps, since there was no city water or electricity available. Walter S. Wood, who later worked for Burwell & Morford as a real estate salesman, may have been one of the first to live in the Morningside Heights plat. When water and electric service finally became available in Wedgwood in 1923-1926, Burwell & Morford began to advertise the sale of lots in Morningside Heights. Enticing advantages of building a house in Morningside Heights were advertised as the availability of telephone hook-up, plank walkways “on most streets,” and that the development was “within walking distance to Roosevelt High School.” What was not said in the advertising brochure was that there was no transportation system nearby, unlike other neighborhoods like Ravenna and Green Lake which were served by streetcar lines. Even in those early years, residence in Morningside/Wedgwood appealed mainly to those who owned autos and would be driving to work. It is debatable whether, nowadays, we would consider Roosevelt High School “within walking distance” from Wedgwood. Morningside Heights real estate brochure of 1923; used by permission. Do not copy. One of the inducements offered each buyer of lots in Morningside Heights was a free set of house plans. The plans included all the specifications so that a carpenter would know how much lumber was required to build the house. This “freebie” thrown in with lot sales helped increase the likelihood that houses of a certain level of quality might be built in the plat. Burwell & Morford would then benefit from the appearance of attractive new homes in the neighborhood which would help more new buyers want to live there. Burwell & Morford also offered a cash prize for the nicest flower gardens planted in 1923, another way of motivating new residents to fix up their yards and help attract even more buyers. A Craftsman-style house, built in 1926. One of the most popular types of houses in Seattle in the 1920s was the Craftsman style, influenced by the Arts & Crafts movement. A Craftsman house meant that skilled craftsmen such as carpenters, masonry men, cabinetmakers and window installers could look at the house plan and build it, without need of an architect. The plans would specify the quantity of lumber and suggest finishes, such as fireplaces and built-in shelving or window seats. The promotion of Morningside Heights by Burwell & Morford, Inc., is the reason why that plat, from NE 90th to 95th Streets on the west side of 35th Ave NE, has more 1920s Craftsman-style houses than other sections of Wedgwood. Along with the Earl J. McLaughlin plat which borders Morningside Heights on NE 90th Street, these two plats in Wedgwood were the earliest to be promoted by real estate development companies, and the two plats have some of the oldest houses in Wedgwood. Walter Wood was one of the earliest residents of the Morningside Heights plat. The life of Walter Wood is outlined in two more articles on this blog, telling of one of the earliest residents of Morningside Heights. In the 1920s descendants of Burwell and another pioneer family of Seattle, the Colmans, were developers of Windermere, a neighborhood on Lake Washington. The Fiddler’s Inn, founded by Walt Haines in 1934, is in the Morningside Heights plat. It is my belief that Walt Haines saw the potential growth near the intersection of 95th and 35th and decided that this would be a good place to set up a business. More resources for house and neighborhood histories can be found in my article on this blog, Finding House Histories in Wedgwood. The intersection of NE 95th Street and 35th Ave NE once had more small businesses than it does now. Residents of the 1920s and 1930s were excited when the Sand Point Naval Station was being developed (beginning in the 1920s) and NE 95th Street was put through as an arterial in the 1930s. There was a drugstore, small grocery and barber shop at the intersection of 95th and 35th. Now the only remaining building is the 1939 barber shop at 9516 35th Ave NE. The 95th Barber Shop, built in 1939, is pictured here in a 1948 tax assessors photo. Photo courtesy of the Puget Sound Regional Archives, repository of the property records of King County. 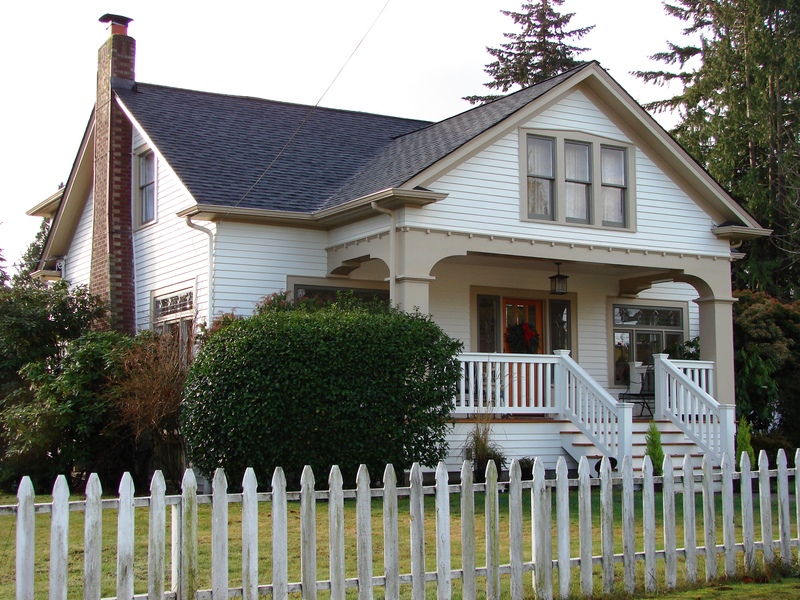 This entry was posted in Architecture, name of the neighborhood, Plat names and tagged 1920s real estate development in Wedgwood, Craftsman houses, Neighborhood History, Old houses in Wedgwood, Seattle. Bookmark the permalink. Thanks once again for brushing up my history! Is that photo of Walter Wood’s house available publicly online from the Puget Sound Regional Archives, or did you have to request it from them? I’d love to see other archived photos of the houses in that neighborhood.